All 300 domestic purebred dog breeds fall into one of 10 major groupings, scientists have told a US conference. A study of genetics and even historical records has revealed how close the breeds are to each other and the order in which they emerged over millennia. "For the first time we've identified progenitor breeds for each type of dog," said researcher Deborah Lynch. Scientists believe comparisons between the dog and humans will lead to new medical treatments in both species. Virtually all modern purebred dogs are thought to have evolved from just a handful of grey wolves in Asia about 15,000 years ago. Pressed into the service of humans, they were bred to bring out traits that would help them fulfil certain roles, such as hunting and guarding. Today, Canis familiaris, to give it its formal scientific name, shows more variation in shape, size, colour and behaviour than any other mammal on the planet. The jigsaw of how these remarkable differences emerged has now been pieced together by Ms Lynch, from the Canine Studies Institute in Aurora, Ohio, and Jenny Madeoy, from the Fred Hutchinson Cancer Research Center, in Washington State. They looked through ancient texts, historical records, archaeological artefacts, works of art and the latest papers on genetics to develop their map of dog ancestry. "It's a new way of thinking about how the breeds evolved," Ms Lynch told the annual meeting of the American Association for the Advancement of Science (AAAS). Her groupings classify dogs into "sight" and "scent" hounds, "working and guard", "toy and companion", "northern", "flushing" spaniels, "water spaniel/retriever", "pointers" "terriers" and "herding". Each developed according to its functional relationship with human beings, said Ms Lynch. For example, the sight hounds include the greyhound, Afghan hound, pharaoh hound and Ibizan hound whose origins can be traced back 6,000 years to the Middle East. Greyhounds are even depicted on Mesopotamian pottery fragments. They evolved to accomplish the task of coursing game - a long, lean machine that could catch and conquer swift prey. The water spaniels/retriever group was designed to wade into water and fetch game. Their earliest known ancestor is the Irish water spaniel, from AD 700, which had a curly, oily coat that shed water, and webbing between the toes for efficient swimming. Among the other examples are the familiar golden retriever and Labrador breeds which were created in the 1800s. And the purpose of all this? "The information on breed history and relationships can help us identify breed candidates for gene study," said Ms Lynch. The results of the Dog Genome Project which will describe the biochemical code driving the animal's body will be published later this year. Scientists expect comparison with the human genetic blueprint finished last year will give them a clearer picture of the causes of disease in both organisms. 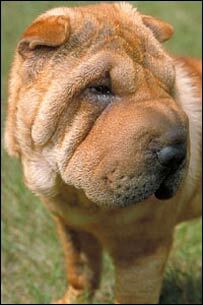 Many of the 400 or so inherited disorders reported in canines are also seen in humans. "Cancer is one of the most prevalent diseases in dogs. Most of their cancers resemble the human counterpart disease much better than the induced disease in lab rodents," said Norine Noonan, from the College of Charleston, South Carolina, who organised the AAAS canine session. "Therefore by understand the basis of cancer in dogs perhaps that will give us a window into the genetic basis of cancer as well therapeutic modalities for both dog and humans." 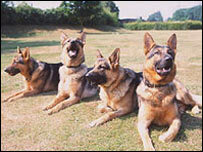 Pedigree dogs are highly defined groups. They are just like isolated human populations - a closed gene pool - and there is also very good medical information on them in veterinary surgeries. All of this means there are real spin-offs in dog research for the understanding of human health and behaviour. "Cancer in dogs and humans is very similar"